Learning How to Dance in the Rain ....: Chemotherapy no 1 !!! Well it is Day 1 after my first chemotherapy treatment and I have to say I am feeling much better than I thought I would - thank you for all the prayers and encouragement that have been sent my way! We started the day yesterday at the chemo unit at around 9.30 - I must say I went in feeling calm - trusting and praying all would go well! I was shown into a side room adjacent to the area with all the chairs that I had been shown before! They said I would be in there as it was my first treatment and we would see how I went - guess if their was any excitement best to keep it out of sight. The staff were cheerful and friendly and the atmosphere was very relaxed. The Dr came to see me first asked a few questions to get a baseline and then we were ready to get going. Step one was to get an intravenous line set up - the nurse looking after me was very sweet but when she found out what B's job was I think it unsettled her a bit. Sadly she blew my first vein - so I asked B to go for a dander and come back once I was set up. A different nurse came in and had success - so that was a relief! Due to my mastectomy I only have one arm available for cannulation so it was suggested I that I should have a portocath inserted along the way. This is a port that is inserted under the skin which can be accessed for blood taking and treatment - it is inserted in theatre as a day case - so we shall see!! It was confirmed yesterday that along with the 4 chemo therapy treatments that I do require herceptin which is also given intravenously ever 3 weeks but for a year!! Anyway - back to the chemo - I was infused with antinausea medication first then came the doxytaxel - the nurse came in with her protective clothing and gloves - I had to laugh as she was protecting her skin against what was going into my body - but they are handling these toxic substances every day so it is completely understandable they don't want to be overexposed. There is a risk of peripheral neuropathy with this drug so I was given some icecold mitts from the freezer to wear on my hands - gee they were freezing indeed - this drug runs in for an hour - so I had no fingers by the end of it. All good though as prevention is better than cure. This first drug is the one most likely to cause an immediate adverse reaction but we sailed through without any excitement - yeha!!! 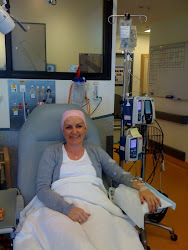 I was so thankful - one after the other I had the drugs infused until almost 5 and half hours later we were ready to go. I had prayed hard the night before that all would go smoothly - so glad it did! The pharmacist had come during this time and given me a bag of tablets to fight nausea and additional side effects - so I accepted them willingly!! Before long b and I were back in the car and heading home. All good - apart from feeling pretty tired and a little spaced out mostly due to the sleepless night and excitement of the day before I think , I was doing okay! When we arrived home Grandpa greeted us with some wonderful news - the biopsy results from Wednesday were in - all clear - yabadabadoo.!!!!! We could do with some good news - not sure where i would have been able to fit in another mastectomy in the midst of chemo, radiation, herceptin, hormonal therapy etc . What a fantastic piece of news! The rest of the day wasn't too eventful - just needed to top up my antinausea tabs and then early to bed. Had a quick skype call to my folks in the UK . My poor dad is having a shock to his heart under anaesthetic today so wanted to reassure him that at least I was off to a positive start! How amazing it is to be sitting on your bed looking at your family on the other side of the world - modern technology - amazing!! I had a few strange tingling sensations in my hands and feet late last night and then felt a bit itchy here and there but it all settled and before long I was fast asleep. I woke this morning not knowing what to expect but so far so good the meds are doing there thing and apart from a few weird sensations here and there - all not too bad. I am just feeling pretty tired but am relaxing today so I cant complain!! A friend said to me yesterday I can see it as poison or liquid gold. I decided I would go for the liquid gold viewpoint - I am never going to be at the Olympics so its as close as Im going to get!! Let that liquid gold flow and mop up all the gunk that we don't want!! I have been online with my pink lady network - each has had a different tale to tell the one poor lady said wait for the pantecnicon truck to hit on day 4 - I am hoping for a small ute/bakkie - or maybe there weren't be much traffic around at all! In any case the start has been better than expected - I am doing everything suggested to prevent /reduce side-effects. Drinking gallons of water, mouthwashing, creaming etc. One down and 3 to go!!! You sweep me into your mighty arms and carry me the rest of the way. What a comfort to know those everlasting arms are there!!! I am doing my best to rest in them every step of the way!